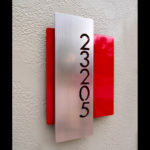 House numbers – Mid Century style! My house number is 337 and the background plate will be Capri Blue. Embrace color! I also have written to my neighbors about getting coordinated with them to etch the number in the granite post on Bedford Road.